2012 Update: This is happening again! “Shop Small” on Saturday, November 24, 2012, and support local businesses like Butter Lane. AMEX users, get your free cupcakes here. 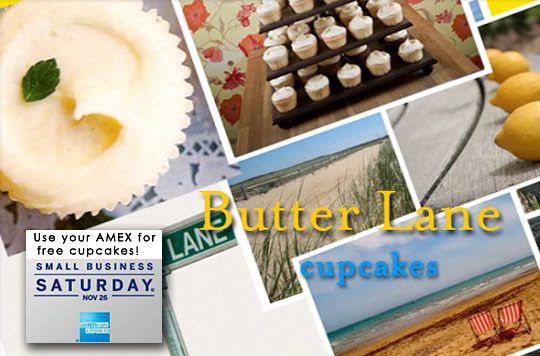 One of my favorite NYC cupcake bakeries, Butter Lane, is participating in American Express’s Small Business Saturday. I don’t usually talk about promotions on my blog, but this both supports small businesses and gets New Yorkers with an AMEX card a dozen free cupcakes! American Express users, if you use your $25 credit (learn more about that here) to purchase “Butter Lane Favorites,” a dozen of Butter Lane’s most popular cupcake flavors, they will give you $5 off! That adds up to FREE cupcakes, people. How do you get this deal? First, register your AMEX card to participate. Then, place your order for “Butter Lane Favorites” at www.butterlane.com. You can pick them up on the Saturday after Thanksgiving at the East Village or Park Slope location. You may also purchase in-store on Small Business Saturday, just make sure to register your card now to get the credit!